Rhubarb and white chocolate crumble was the first thing that came to mind when I saw the big bunches of bright scarlet rhubarb for sale at our local farmers market this weekend. It was an old winter favourite in New Zealand but it’s not something you see often in Queensland and can be quite hard to come by. Our mild climate down on the coast makes it almost impossible to grow but up on Mount Tambourine there are a few people who must have some good established patches. They’ve been bringing supplies down to the Brisbane farmers markets for a few years now but it doesn’t last long so you need to get in early. I jumped straight into that line and in hindsight should really have grabbed an extra bunch for my breakfast this week and a few other recipe ideas I want to try, hopefully they’ll have some more in the next few weeks. I don’t make a lot of hearty winter puds but this is a classic comfort food with a bit of a surprise from the pockets of molten white chocolate hidden inside the tart fruity goodness. I know some people like to cook their rhubarb with a good dose of sugar but for this one I use a light hand as I like it to stay a bit on the tart side so there’s a contrast with the bursts of chocolate. The biggest trick with stewing rhubarb is to keep a close eye on it to hit that point where its all soft but still holding its form. It probably doesn’t taste a whole lot different but the visual appeal is much better. If stewing it I use the minimum amount of water to stop it sticking, stir a few times and add a tight fitting lid so it steams through evenly. If you’re cooking a dish where the presentation of the rhubarb is on show you can’t beat basting it well and roasting it. It will cook evenly but hold together much better for visual appeal. Clean and cut the rhubarb into 3 cm pieces and place in a saucepan. Sprinkle the sugar on top and put just enough water for a thin layer on the bottom of the pan. Place on medium heat and allow it to simmer. Stir occasionally until cooked. It will take around 5 minutes, you are looking for the point where it’s uniformly soft but still holds its shape. Drain off the liquid and allow to cool. In a clean bowl add all the crumble ingredients except the chocolate. Using a rubbing motion between the fingers break up the butter and combine with the dry ingredients. Keep going until it’s crumbly, evenly coated and you have no more lumps of butter. 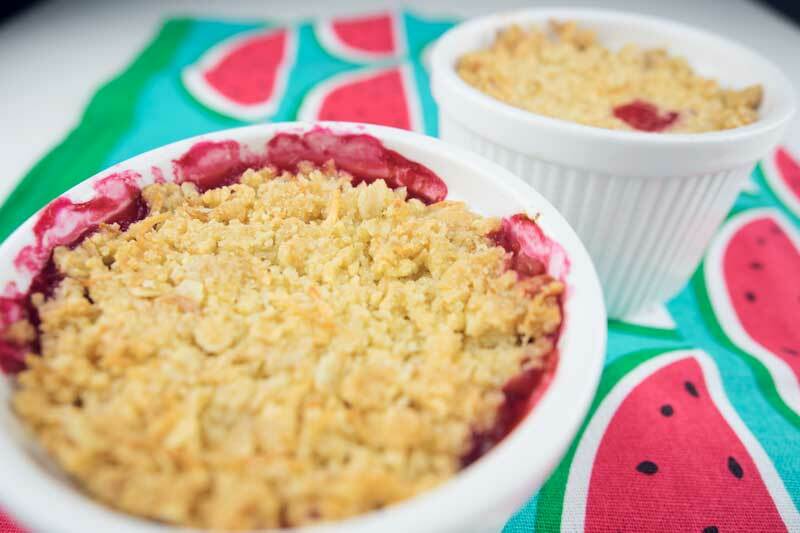 Place cooled rhubarb into serving dish or individual ramekins. Stud with the pieces of white chocolate and push into the fruit. Top with the crumble mixture and press down gently. Cook at 180° Celsius for 25 minutes until the fruit is bubbling and the crumble is golden. can this be frozen or made ahead and put in fridge? Hi Leanne, you can make ahead and keep it in the fridge for a couple of days but personally I wouldn’t freeze the complete crumbles as any moisture when it defrosts may make it soggy. I also regularly make a bigger batch of crumble topping and put that into the fridge or freezer for a quick pudding at another time when stewing fruit is plentiful.